This is a hearty and flavorful vegetable beef stew recipe with potatoes, carrots, and a thickened broth. 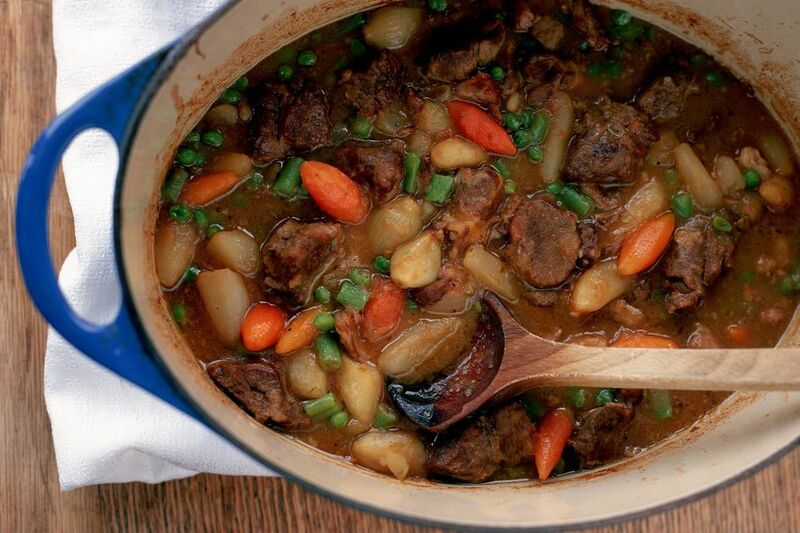 The stew is a basic combination of ingredients. The condensed beef broth gives it more beef flavor than just plain water or stock. Feel free to add some diced rutabaga or increase the vegetables in the stew. Rutabaga would be a tasty addition, or add some frozen peas or green beans shortly before the stew is done. Cut the beef into small, bite-sized cubes. Heat the vegetable oil in a Dutch oven or large kettle; add the beef, seasoned salt, and chopped onions. Cook, turning frequently, over medium heat for about 10 to 15 minutes, until the meat is browned on all sides and chopped onions are tender. Drain off excess fat if necessary. Add the beef broth and some hot water to the pot until the liquid level is about 1 inch above the beef. Cover and reduce heat to low. Cover and ​simmer for 1 1/2 to 2 hours or until the meat is tender. Add the potatoes, carrots, and celery. Cover and cook, stirring occasionally, for 20 to 30 minutes longer, until vegetables are tender. To thicken the stew, combine the flour with 1/3 cup cold water; stir until smooth. Gently stir flour mixture into the pot a little at a time, using as much as needed to make the stew as thick as you like it. Add pepper and taste for seasonings, adding more seasoned salt if necessary. For a hearty, stick-to-your-ribs meal, add a few tablespoons of barley about 45 minutes before the stew is done. Add about 1/4 to 1/2 cup of dry red wine along with the water for some extra flavor. "I was extremely surprised as to how easy this recipe was. My husband was shocked to find out that I made it from scratch. It took about 30 minutes to prepare. Then it simmered on the stove for about an hour. I will definitely keep this as a winter meal. Did I mention — It was gone in one day" S.C.